When right clicking on an application program (its icon) on the Windows 7 Superbar (Taskbar), he or she will be presented with a Jump Lists, which show contextual menu items which related to the particular program, such as listing recently used documents and files, ability to run another instance of the program, option to pin or unpin the application on the Taskbar and click to close (all) windows. 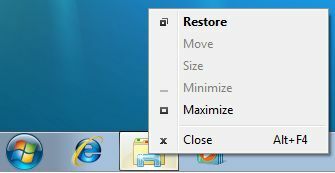 In previous older version of Windows operating system, such as Windows XP and Windows Vista, user normally will have access to ability to “Restore”, “Move”, “Size”, Maximize”, “Minimize” and “Close”, which deal with the running window represented by the button on the Taskbar. In order to reveal, show and get back the old classic right click context menu when right clicking on an icon on the Taskbar which the program is running, user has to press and hold down the Shift key, and then right click on the Taskbar’s application’s icon. For the non-running application pinned to Taskbar, Shift+Right Click will reveal the complete right click menu for the shortcut, as when right click on Start Menu items, but with full set of command items such as Open file location, Copy as path and Run as different user.